Give the gift of TimberSeal this holiday season! TimberSeal, LLC offers a wide range of gift certificates to accommodate your gift budget and they are 100% refundable if not used! What better gift can you give than to lift the burden of exterior home maintenance off your friends and family. From exterior house washing to the refinishing of decks, fencing and playsets your TimberSeal Gift Card can be used toward any services we provide. Should you or your gift recipient decide not to utilize the gift card simply contact us for a prompt refund of the full gift card amount at anytime. 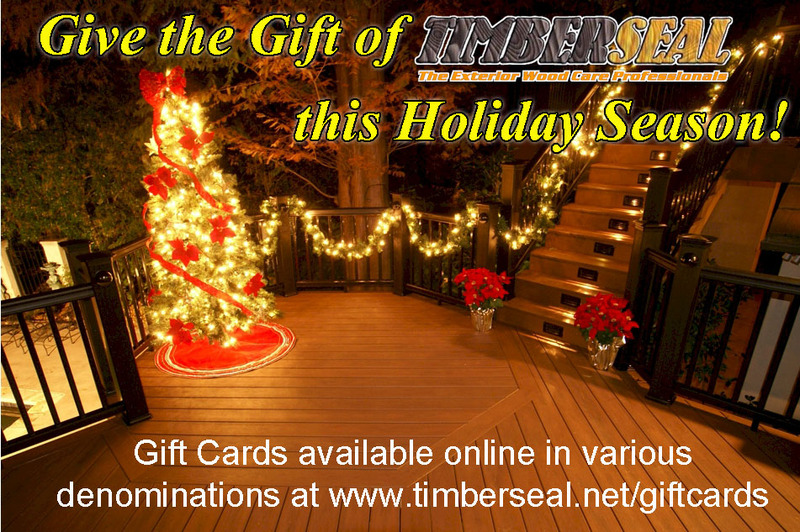 TimberSeal Gift Cards… the no risk gift for your holiday shopping season! Upon completing the purchase of your TimberSeal Gift Card your purchase will be mailed in a beautiful gift box ready to gift! No need to take the time to pick it up and wrap it! It will be delivered via the US Postal Service within 3-5 days of your order. In need of a gift card right away? Call our office and we’ll promptly deliver it in person for a $15 handling fee otherwise it ships to you free of charge. 1-866-WOODCARE or (219) 548-2670.